There is a gradual yet perceptible change happening in our top management institutions as far as research and publication is concerned. More faculty are taking research seriously, and targeting top journals to publish their findings. This shift is the result of three drivers: Firstly, institutional policy changes now place more emphasis on research output as a requirement for promotion. Secondly, a new generation of better trained and research-oriented faculty has joined these institutions. And, thirdly, and perhaps most importantly, there is a growing aspiration to be seen as more than a teacher, i.e. to make a place for oneself among the larger academic peer community. 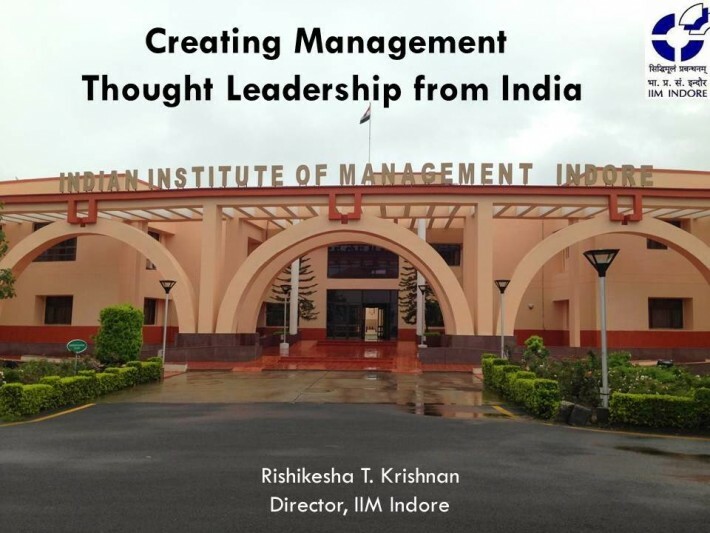 Many observers of Indian management academia have been critical of our failure to achieve thought leadership. What these critics seem to mean is that we don’t have management gurus from India who are world renowned, and whose ideas are eagerly applied by managers everywhere. We have no Michael Porters or Philip Kotlers from India. Of course, there have been India-born management gurus like CK Prahalad or Sumantra Ghoshal, but they made their reputations outside India’s borders. Thought leadership is not achieved by merely proclaiming oneself as a thought leader. You can be called a thought leader only when others believe you are one! Thought leadership has some of the characteristics of what we in strategy call a difficult-to-imitate resource. Becoming a thought leader is a causally ambiguous process – it’s difficult to outline an algorithm that will necessarily lead to thought leadership. It’s also somewhat path dependent – you have to be at the right place at the right time working on the right theme. Whether you consider Boston Consulting Group’s Growth Share Matrix, or Prahalad’s “Bottom of the Pyramid” or Vijay Govindarajan’s “reverse innovation,” all of them achieved widespread traction only because they were relevant to real issues that businesses were facing. Of course, just good and relevant ideas may not be enough. There is often an element of marketing and branding that goes into thought leadership these days. One barrier to the development of thought leadership from India has been the absence of role models. We haven’t had people we can look up to, working from within India, who have achieved this status. Luckily, that’s changing now. An important milestone in the evolution of Indian management thought leadership was crossed when, in December 2013, an article titled “Why Conglomerates Thrive” was published in Harvard Business Review (HBR). What was special about this? Well, to the best of my knowledge, this was the first time that an article written by business academics based in India was published in HBR. HBR has an iconic yet paradoxical status in the world of management academia. It is not the typical peer-reviewed, research-based journal full of complex mathematical models or tables of regression coefficients. Yet, it is arguably the most influential management publication outlet as it is read by managers all over the world, particularly in important markets like the US. HBR may not figure on the “A” lists of leading business schools when it comes to research rigour, and business academics may speak about it disdainfully. Yet I doubt that there are many business academics who don’t have a strong yet secret desire to be have their ideas feature in HBR. Put simply, having your ideas published by HBR is an important step to achieving thought leadership. 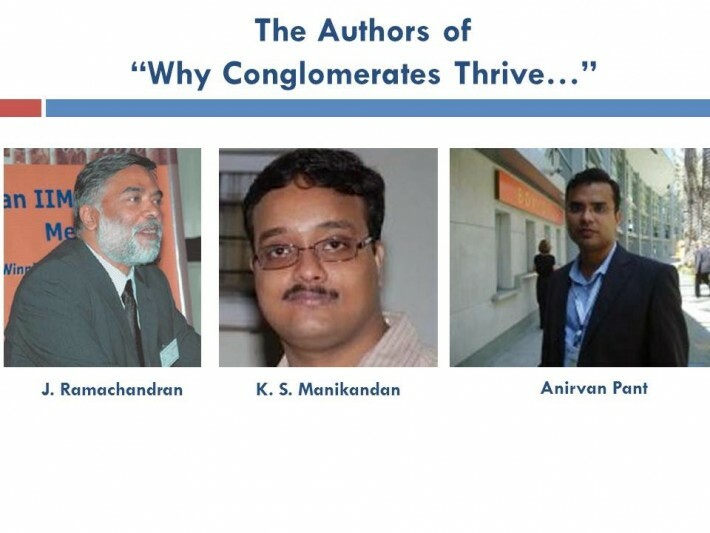 I have had the privilege of knowing the authors of “Why Conglomerates Thrive” closely. 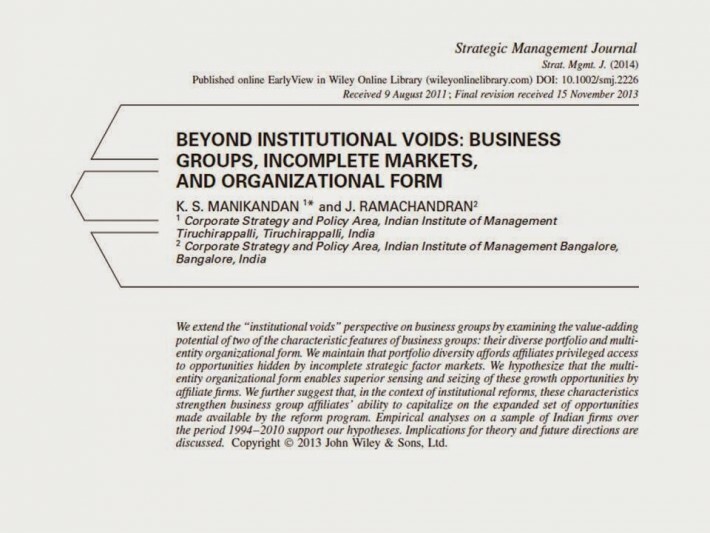 Prof. J. Ramachandran (JR), the lead author, was my senior colleague at IIM Bangalore (IIMB) from the time I joined there in 1996. The other two authors, KS Manikandan and Anirvan Pant, were both doctoral students at IIMB, and are today faculty members at IIM Trichy and IIM Calcutta respectively. JR’s story can be a good source of inspiration to management scholars from India aspiring to thought leadership. A chartered accountant by training, JR graduated from the doctoral programme at IIM Ahmedabad in the 1980s. 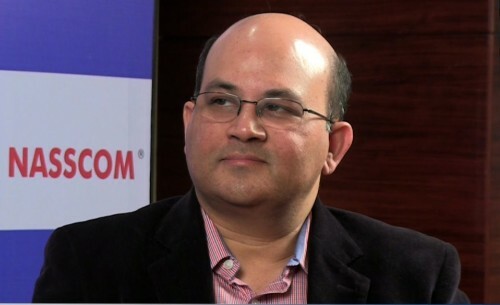 He had a long spell in the corporate sector (Reliance, Mudra) before joining IIMB as a faculty member in 1991. This was a good time to become a management faculty member, with economic liberalization just taking root and IIMB itself embarking on a journey of change under the leadership of Prof. KRS Murthy (path dependence at work!). JR’s academic journey started with his focusing on building his reputation as a teacher. He must have done this very well because almost any IIMB alumnus from the 1990s whom I meet asks about him! This is corroborated by his amazingly consistent high teaching feedback scores. Troubled by the lack of good case studies from the Indian context, JR embarked on writing cases to fill this gap. His cases on the Indian Watch Industry (the eclipse of HMT and the emergence of Titan) and Reliance (co-authored with Sumantra Ghoshal) made a mark, and he received several case awards. Case-writing has continued to be a passion for JR, and his cases on Bharat Forge, ITC and Hindustan Unilever (all with different co-authors) have been recent hits. Teaching, case-writing, and consulting were his focus areas till around 2003. A few important decisions followed: He decided to submit at least one paper every year to the Academy of Management (AoM) annual conference, the most prominent conference for academics working in “management” (organizational behavior, human resource management and business policy/strategy) in the US. He became active in teaching in IIMB’s doctoral programme and soon had some of the best doctoral students working with him. Over the last decade, JR remained wedded to three things – relevance, rigour and strong conceptual thinking. 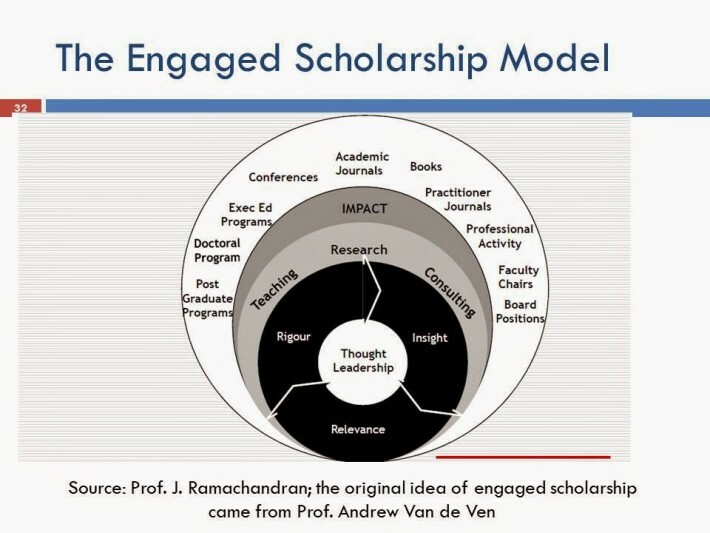 This combination of what Van de Ven calls “Engaged Scholarship” has been the distinctive feature of his journey towards thought leadership. JR’s own intellectual contribution may have been more on the relevance and conceptual dimensions but he worked closely with talented and contemporary doctoral students who could bring in the methodological rigour that they had imbibed from their doctoral training. While many scholars from India have taken the route of collaboration with established names abroad to navigate the treacherous waters of publication in top journals, JR eschewed this and took the risky path of going on his own. There were many disappointments on the way, but his fierce determination driven by confidence in his own ideas enabled him to overcome these setbacks. During this journey, he remained focused on two themes: the evolution of Indian business groups (with a strong belief that the Indian business group has many strengths that are not apparent to the west) and the internationalization of Indian firms. What can we take away from the JR Story? There are several takeaways from the JR story. At the top, I would emphasise the importance of how we faculty see ourselves, i.e. the question of identity. As I mentioned in an earlier post, we need to see ourselves as more than teachers. JR’s experience suggests that we need to see ourselves as engaged scholars, striving for rigour, relevance and conceptual or theoretical clarity in all we do. This identity needs to be backed up by strong aspiration and drive. Without that we simply won’t have the intellectual and physical energy to overcome the obstacles that will inevitably come in our way. Almost all successful people have a certain perseverance and doggedness that differentiates them from others who give up along the way. Trying to achieve thought leadership is no different. Choice of problems and focus are also critical. We need to work on problems that are of importance to India but have wider significance. The unique strengths of (Indian) business groups are of interest within our country, but also to managers elsewhere because they call into question some of the “accepted wisdom” on the demerits of conglomerates. “Bowling alone” is unlikely to work. We need to find good collaborators who complement our skills. JR found them in some very talented and capable doctoral students. Others might find them in colleagues within India or abroad. I haven’t taken Prof. Ramachandran’s permission to write about this. But I am confident that he won’t mind as long as this acts as an inspiration to many others! We are privileged to begin a new weekly column titled ’Jugaad to Innovation’ by Prof. Rishikesha Krishnan, Director – IIM Indore. Read all articles by Professor Rishikesha Krishnan on Jugaad to Innovation here.